The stone on the second line has to be strong. e.g. monkey jump (Black a) doesn't work here because of the weakness at b. White can play at . If Black responds at , then the atari at and the throw-in at will capture all the black stones. 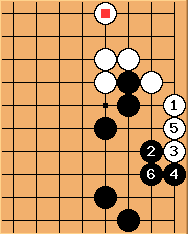 Thus in response to , Black can only connect at , then White plays at , and you can see the difference yourself! See also Endgame Tesuji 4 for a more subtle case where the monkey jump is not an outright failure, but clearly suboptimal. The following two diagrams describe a gamesituation during one of Malweth's games on DGS. 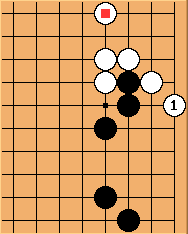 Black cannot respond at a, because white would connect via 2 due the marked black stone being in the fourth line. 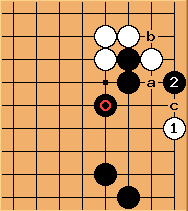 If Black plays at a, then White and Black at b, White can escape with two liberties. In case Black plays at c after b White gets three liberties to Black's two. 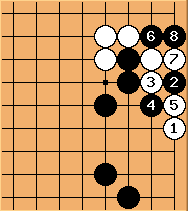 In such cases, endgame tesuji 14 may work and win about as many points as the monkey jump.